While Turkish Prime Minister Recep Tayyip Erdoğan continues his presidential campaign, he took time out to show his talent on the football pitch. He took to the field in a football friendly to mark the opening of a new stadium in Istanbul. Attending the opening ceremony of the Fatih Terim Stadium in Başakşehir, Istanbul on Saturday, Erdoğan, who is a former semi-professional footballer, played a friendly game with some Turkish celebrities including TV producer Acun Ilicali, and stage-movie actor, film producer and writer Yılmaz Erdoğan. Coached by Turkish national team manager Fatih Terim, the Orange Team lineup included Istanbul Mayor Kadir Topbaş, AK Party's Istanbul chair Aziz Babuşçu, Turkish Football Federation Chair Yıldırım Demirören, former football star Rıdvan Dilmen, former NBA star Hidayet Türkoğlu, television producer Acun Ilıcalı, as well as the Turkish PM's son, Bilal Erdoğan. The White Team included professional goalkeeper Volkan Babacan, former football star Mehmet Özdilek, Turkish actor Yılmaz Erdoğan and Erdoğan's son-in-law Berat Albayrak, as well as several officials from the TFF. Prime Minister Erdoğan's Orange Team did not start well. 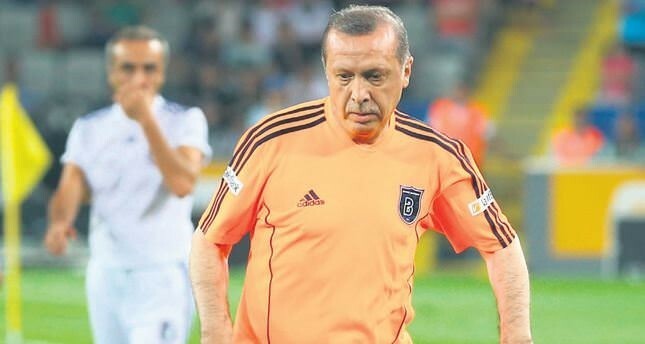 Clad in a bright orange football strip, Erdogan saw his team fall behind 0-3 in the opening minutes of the game. The White Team scored three early goals with former Turkish football star Mehmet Özdilek putting in a throwback performance. However, the Orange Team answered quickly through Erdoğan's three goals. He smashed a shot past the goalkeeper and into the net with an impressive right foot strike. Then ever better was to come, when he sent a deft left-footed chip flying over the goalkeeper's head. Some 15 minutes after the first goal, Erdogan completed his hat-trick with an easier shot. Prime Minister Erdoğan's goals brought the score to 3-3. Turkish TV producer Acun Ilıcalı scored another goal from the penalty spot, putting the Orange Team in front. The first half of the match ended 4-3 to the Orange Team. At the end of the match, Erdoğan's team won 9-4. Erdoğan played in the first half but was substituted in the second half. According to Turkish football commentators, Erdoğan's performance and the goals he scored were impressive. His style was likened by some on social media to former German football star Franz Beckenbauer and Barca star Lionel Messi. Erdoğan's second goal was particularly praised by both proand anti-government tweeps. His chipped goal brought to mind efforts by Messi and former Romanian star Georghe Hagi, according to some. Turkish national team manager Fatih Terim said, "Erdoğan's performance was fine. His goals were amazing." "Our prime minister scored one classy goal after another. It was a unique experience to have the chance to play with our prime minister," said the goalkeeper on Erdogan's side, Ufuk Ceylan, who will play for Başakşehir this season. Erdoğan is known for his interest in football. In his youth, he played semi-professional football at local club, Kasımpaşa. He was a successful player and one of the Turkey's biggest clubs Fenerbahçe wanted Erdogan to transfer to club. But he later followed a political career. The stadium of the local football club of the district he grew up in, Kasımpaşa S.K. is named after him. Prime Minister Erdoğan made an interesting statement by wearing the number 12 uniform. If Erdoğan is elected, he will be Turkey's 12nd president next month.